This is the fifth post covering events at Shore Leave 2014, a convention of artists, performers, writers, scientists, and fans of science fiction and fantasy in general that took place from August 1 through August 3, 2014 in Hunt Valley, Maryland. 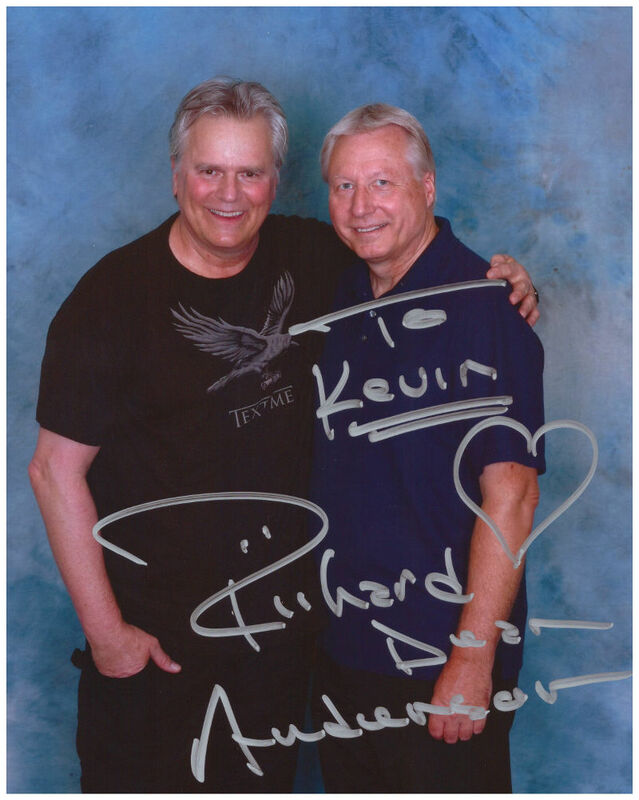 One of the guests at Shore Leave 2014, and the main attraction for many, was Richard Dean Anderson of MacGyver and Stargate SG-1 fame. And, of course, I had to get a picture! He took time to talk to everyone, both in the picture line and the autograph line. He also gave a couple of talks and answered questions. I was only able to see one of the talks as I had a writing workshop during the last one. During the first talk he asked everyone to sing happy birthday to his daughter Wylie Quinn Annarose Anderson. He had come here (with permission from Wylie) instead of being with her on her sixteenth birthday (August 2). He had to record it twice (on his phone). The first time didn't work. As he was having trouble with his phone, someone yelled out, "MacGyver would fix it!" He replied, "I'm trying!" Yes, I did! Even though I'm not so much into science fiction as I am horror and other genres, there was something for every type of writer. I got to meet a lot of authors, both new and accomplished, many of whom have had experiences similar to my own when starting to publish. I got a few tips, a few contacts, and may go again someday! He really did take time to talk to people and shake their hand. He even joked about taking so much time that somebody ought to make him shut up and keep the autograph lines moving. He would talk about ice hockey to anyone wearing a hockey jersey. I mentioned that I heard he didn't do too many of these shows, and he said he prefers the smaller conventions (like Shore Leave) over the larger ones. Then he went on to tell me a story about how bad he felt at one convention where people had waited in line for four hours to get his autograph. He said, "I wish someone had told me what was going on. I would have come down (to the autograph line) sooner."